Home / Getting Started / How to purchase licenses in Cloudiway Platform ? How to purchase licenses in Cloudiway Platform ? This article explains how to purchase licenses in Cloudiway Platform. To purchase licenses, log into your account at https://apps.cloudiway.com. Then click on the “Buy” button on the account menu. 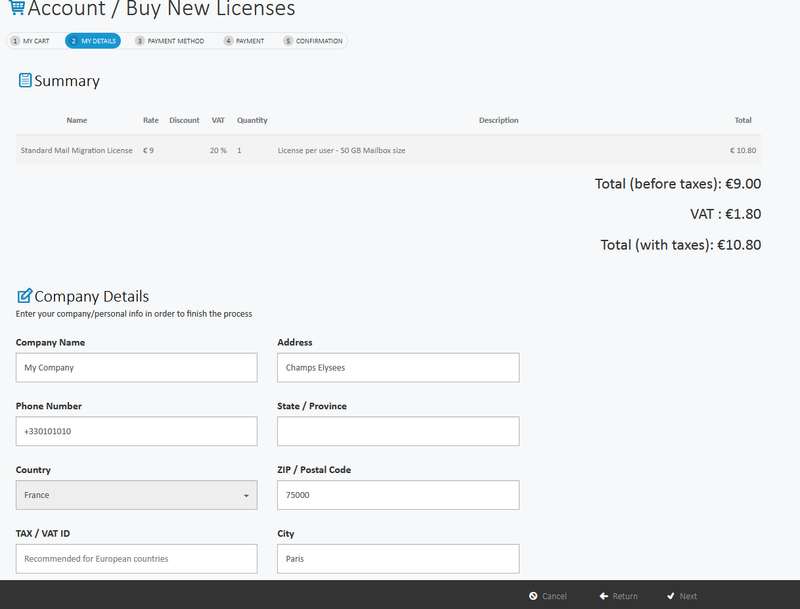 Add the licenses to the cart by choosing the required number of licenses. Check the Pricing summary and click on Next. Check the company’s details and click on Next. Choose your preferred method of payment and enter the required information to finish a payment. Your licenses will be automatically assigned to your master account once the payment procedure is completed.